Not intended for use within the Arctic or Antarctic circles. Sky darkness results are for tonight through to tomorrow morning. Astrophotography. The key here is knowing when the sky is as dark as possible. Use the calculator to ensure that (i) you are within astronomical twilight and (ii) the moon either hasn't risen yet or is a new moon. Moonlit Nightscapes. The key here is knowing when you'll have the desired ground lighting. Use the calculator to ensure that (i) the time is an hour after moonrise or an hour before moonset (often ideal), (ii) this coincides with nighttime, and (iii) the moon is near a full moon to give shorter exposure times. Lunar Photography. The key here is knowing when the moon itself appears as desired. Use the calculator to ensure that (i) the moon has risen during nighttime and (ii) the moon is at the phase you want to photograph (such as a crescent if you're after a moody cloud-shrouded shot, or gibbous to bring out its surface detail). Size. The terms gibbous and crescent specify whether the moon is greater than or less than half illuminated, respectively. The special cases of new moon and full moon refer to no illumination and full illumination. Phase Direction. The terms waxing and waning specify whether the illuminated portion of the moon is growing or shrinking, respectively. Midnight. This describes when the sun is farthest below the horizon, and corresponds with when the sky is darkest. Whenever there is no sunrise or sunset, such as near the poles in summer and winter, this describes the time of day when the sky is least bright. Astronomical Twilight. This describes when the sky becomes completely black and is suitable for astronomical observations of faint stars. It corresponds with when the sun dips to 18° below the horizon. However, at high latitudes during summer, the sun may never actually dip this far below the horizon. Moonrise & Moonset. These represent when the upper edge of the moon's disc disappears below the horizon — regardless of whether that portion of the disc is currently illuminated. Just as with sunrise and sunset, side lighting from the moon will cast long shadows and often appear most striking, so the hour after moonrise and before moonset may give optimal light for nightscapes. Unlike sunrise and sunset though, the moon rise and set times are typically 50 minutes later each day. This one is more useful for daylight photography. 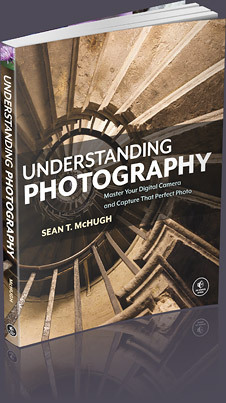 Gives an overview of the unique challenges for photography at night. Discusses how different times of day affect subject appearance.